On day 1 participants obtained hands-on experience with the traditional tutor-web and on day 2 it was time to look at some of the new additions which many people have not heard about. The plan is therefore to cover the Smileycoin reward system, peer tutors, self-evaluation, peer-evaluation and approaches to open-ended assignments. In addition a review is needed since new people arrive throughout. 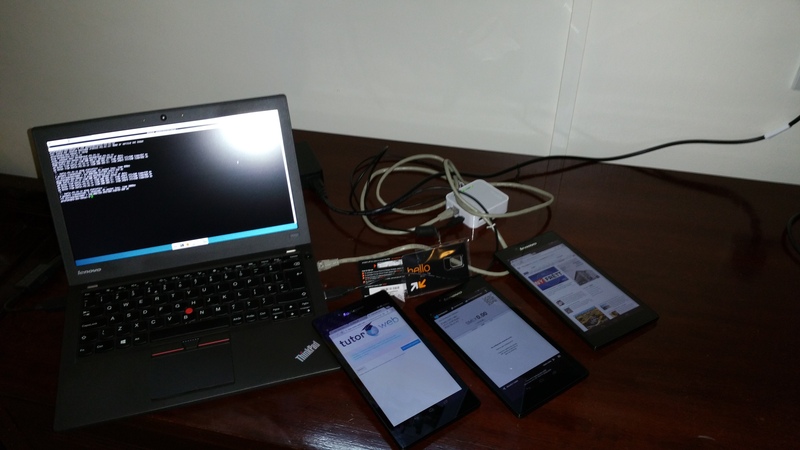 Recall that the system being demonstrated and tested consists of a laptop and multiple tablets. The laptop is a tutor-web server and runs both a WiFi access point and sim card-based Internet connection, all off the laptop battery. 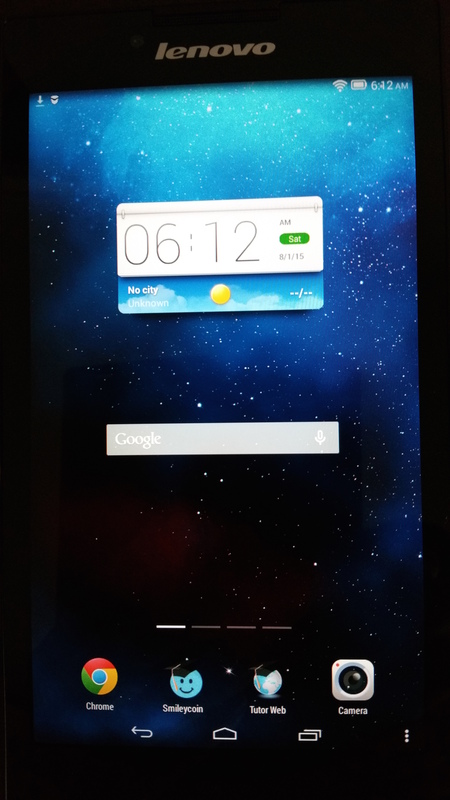 The tablets link to the laptop using WiFi when needed but otherwise they can run offline. Consider for a moment a graduate course in mathematics or statistics. Here we have advanced students who are developing an overview of their field. Simply answering multiple-choice questions is clearly not enough of a challenge. Some years ago experiments were conducted in having student take notes off a whiteboard, typeset them using LaTEX and set the result up as a tutor-web course. The result was MATH 612 on the tutor-web, Computing and Calculus for Applied Statistics. This has since been reviewed many times by students and temporary staff and now stands as a complete course, which is a requirement for some fields of study. This experience led to the development of student-submitted questions. A student who has reached a minimum grade will occasionally be asked to write a new quiz question, or to peer-review a student-submitted question. The word "occasionally" is important since these tasks require considerably more work than most multiple-choice questions. Note though, that ,ost of these will always be requests to review since each submitted question needs several reviews. An example of this is given as the last lecture in MATH 099 on the box (at http://box.tutor-web.net, if it is turned on). 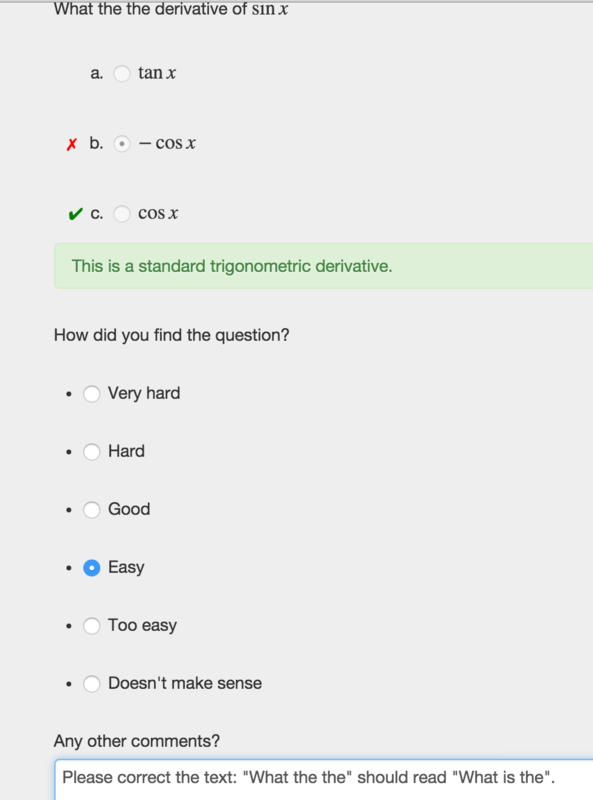 Just click on the correct answer to increase the grade. Once the grade is over 5 you will receive questions to write or review. All the lectures in CCAS at MATH 612 are of this form, where the probability is set to 50% of getting a question to either write or review. Once the question has been answered, the evaluation form pops up. In this case it is appropriate to point out a problem with the text. The submitter will get the option to correct the question. When a student's grade reaches about 50%, the student is awarded a Smiley. More specficically this is a Smileycoin or SMLY, which is implemented as a cryprocurrency. The student can get an overview of the number of SMLY already earned and can in fact redeem these coins into a wallet. 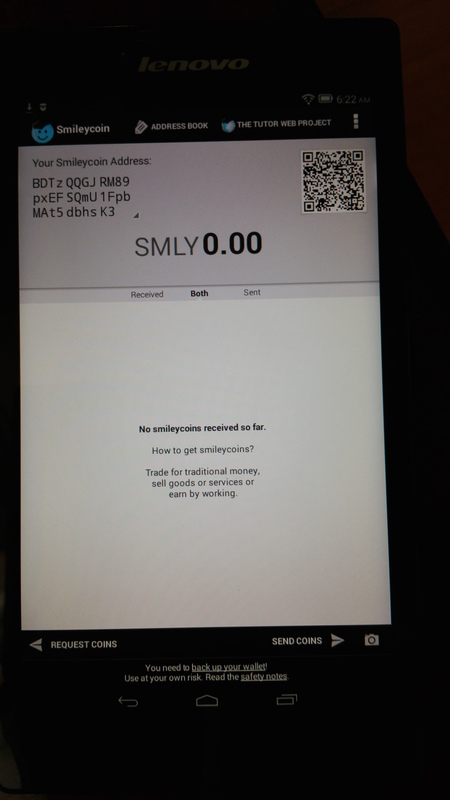 Clicking on the SMLY wallet gives the opening screen. This screen has been set up so as to link easily with the tutor-web. 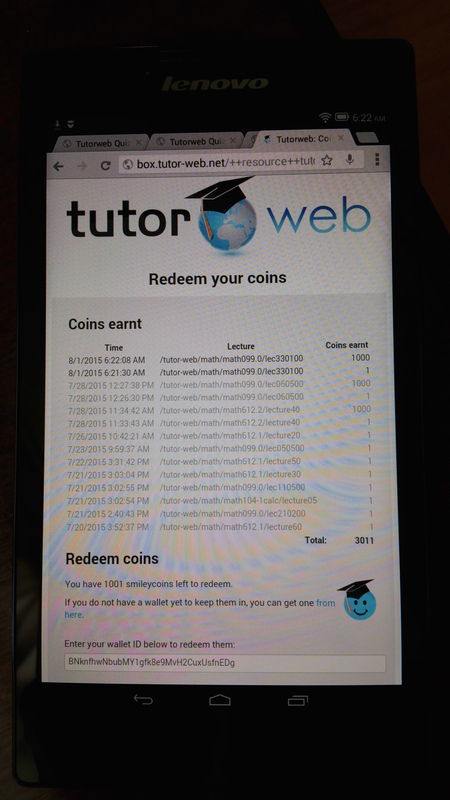 To redeem coin into the wallet, the user clicks on the tutor-web logo in the wallet. 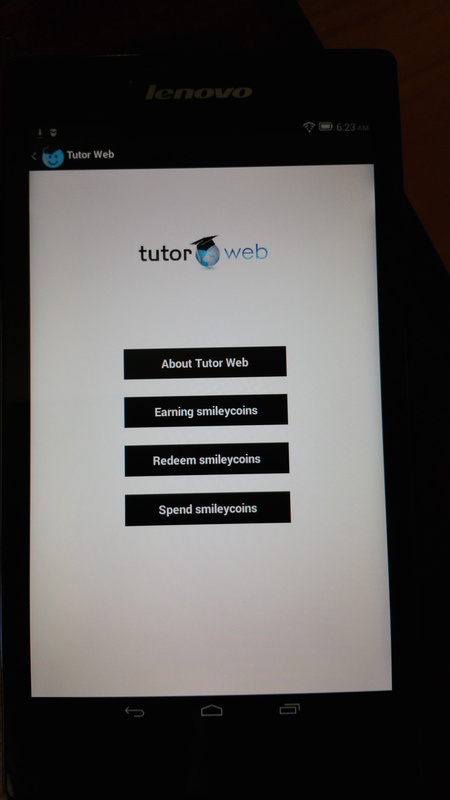 The user now has several options relating to the tutor-web, including earning and spending SMLY. See another note on Smileycoin economics to see where this may go in the future. In fall of 2015 a new feature will be added to the tutor-web, peer-tutoring. In the tests to be conducted in fall 2015, a class will be split into two groups, "students" and "tutors" where the students will pay tutors 1 SMLY and then ask the tutors questions. It remains to be seen how this develops. Naturally, the hope is that tutors will continue to tutor their peers. The plan is for each tutor to set a rate in SMLY and they will receive a performance grade from each student. A student will be able to select a tutor according to the hourly rate and performance.